You can find your mailbox in the sidebar on your home screen. It displays all notifications from chats, discussions, and comments. Your Mailbox has a few functions to help you organize your communications. To the right of to each mailbox item, you will see three icons: a thumbtack, a flag, and an "X". Click the flag icon to mark important items for fast retrieval. Each mailbox folder has a "Flagged" tab where these messages will be consolidated for easy access. Your mailbox also has its own dedicated "Flagged" folder where you can see a consolidated list of all flagged items across folders. Click the thumbtack icon to the right of the item to pin an item. Pinned items will stay at the top of the folder view. If you want to keep track of an older comment, for example, you can pin that comment to see it immediately at the top of the list of communications. Click on the “X” to the right of the item to delete a message. The message will disappear from the list. Note that deleted messages can still be viewed in the Trash folder. How do I configure mailbox folders? The mailbox comes with a pre-configured default set of folders, but you can also add your own configurable folders to collect and view your mail in different ways. Trash - shows any messages you have deleted. To create a new folder, right-click on “Mailboxes" and select “Add Folder”. After you name the folder and click “Create”, the new folder will appear within your list of mailbox folders. How do I add sorting rules to new or existing folders? To add a sorting rule to a folder, right-click on "Mailboxes" and select “Rules" to see a bullet-point list of mailbox rules. Click on an existing rule to edit it, or choose "Add to a Folder" to create a new rule. Each rule has three parameters: “When,” “If,” and “Add To.” Both “When” and “If” are conditions that allow you to determine which type of mail is delivered to a folder. Use “When” to select what type of notification you would like to appear in your folder. 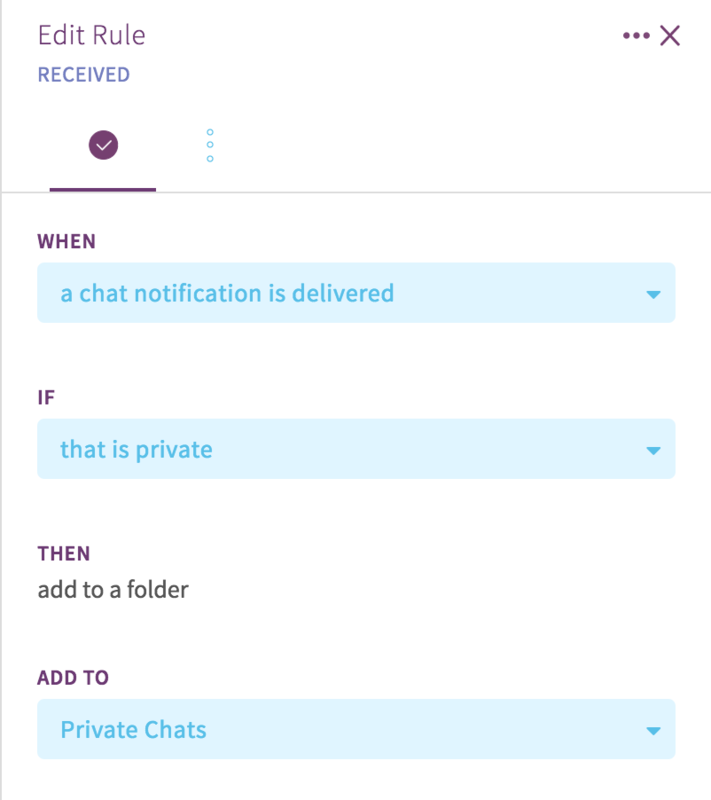 “If” gives you the option to restrict whether or not the message comes from a specific user, project, or is a private message. “If” can also be left as “No Additional Condition” if the only restriction you would like to place is the type of notification. Type the first few letters of your folder name into the “Add To” dropdown to designate which folder you would like to apply the rule to.